Metabolic Engineering Group is working on projects to develop new technology for the improvement of gentian cultivation. Gentians such as Gentiana triflora and G. scabra are important ornamental flowers in Japan, but their biology; especially, mechanisms of flowering and dormancy remain largely unknown. The complete understanding of the mechanisms may allow control of flowering time and stable production for several years, resulting in industry promotion of gentians. We are now studying the expression of flowering-related genes to clarify gentian flowering. 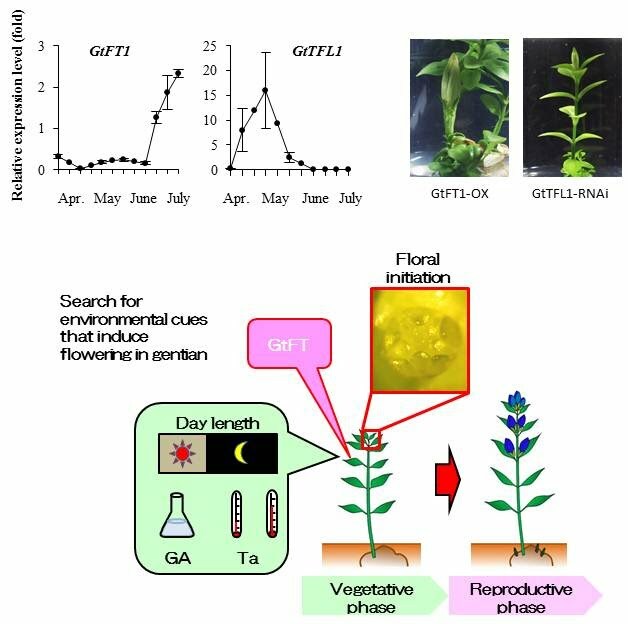 To date, we isolated and characterized gentian orthologues of the FT/TFL1 gene family, denoted GtFTs and GtTFL1, which control flowering time of G. triflora, G. scabra, and their hybrids. Our group plans to explore environmental cues inducing a gentian flowering using these genes. Gentians produce overwintering buds (OWBs) in autumn to survive the winter. Dormant OWBs have high tolerance to cold and freeze, but insufficient dormant OWBs cannot survive the winter. Our group performed metabolome analysis using Q-TOFMS and revealed metabolic changes during dormancy. When the dormancy mechanism is completely understood, we can regulate dormancy processes to provide a stable production of gentians.